Let’s face it, unless you are a Winnie the Pooh or Disney enthusiast, you are pretty much screwed once you have a kid, as far as acquiring anything for your child to match your punk rock lifestyle. Welcome to your newly decorated home, soon to be littered with all the non-recyclable, neon red and blue plastic crap to keep your baby happy as a little clam! As new punky parents we are forced into a different kind of consumers world, one which makes us believe we must purchase a multitude of brand new “eyesores” in order to make our children happy. Not so, according to Winter Rosebudd. 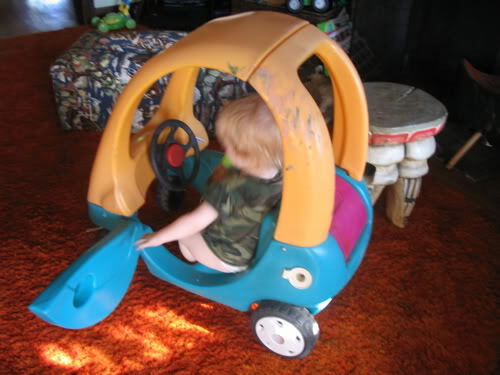 With a trashed hand-me-down Little Tykes car, a glue gun, some paint and scrap materials, she was able to save money, help the environment (by recycling an old kiddie car), and wind up with a really cute kiddie car toy that matched her families home and lifestyle! Not to mention her 2 year old had a blast helping her re-design it, making it that much more special. Fabric and trims. Here’s where you get creepy and crafty! The skies the limit! Don’t forget to hit the auto parts store for all kinds of stick on mirrors and reflectors. Hot glue gun, glue sticks, scissors. Possibly a needle and thread, or a sewing machine if you want to make curtains. One energetic toddler, to chat and climb all over you, while you are working. Just keep the glue gun and scissors out of reach. Yeah. Start by cleaning the kiddie car really well. In a well vented area, spray paint the entire car, the desired color. If doing 2 colors, then mask off your areas. I suggest doing 2 coats of paint and let it dry completely. 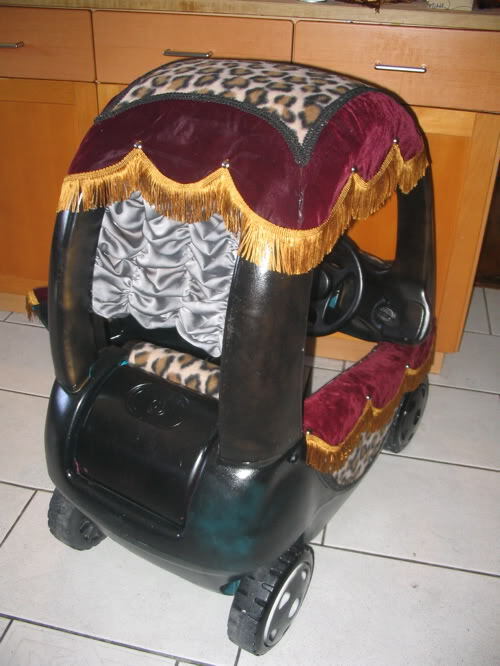 After the kiddie car is dry, start working with your fabrics and trims. If you are putting fabric on the top of the car, like the leopard one, lay a big piece of fabric over the top and mark four corners, so you can cut out a cool shape. Glue the shape on top, then cover the edges with a trim, such as a 1/2″ flat braid…just glue it down all around the edge. Same goes for the doors and seats. Now add your accessories. You can buy small domed mirrors for the hubcaps and headlights…they work great! Don’t forget the fuzzy dice and air fresheners for the new kiddie car!